Once Cobra Commander was a man, but he left his wife and son behind for unknown reasons to become a terrorist mastermind. This ruthless leader of Cobra has risen from the dead to take his rightful place as the leader of the earth-shattering Decepticobra Alliance, and he's also ready to take his rightful place in your vinyl collection as this terrific Transformers vs. G.I. 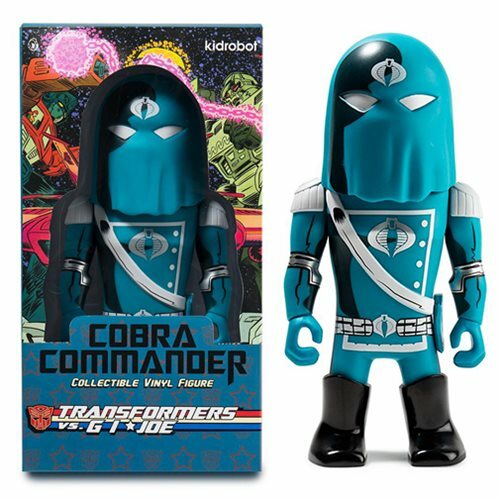 Joe Cobra Commander Medium Vinyl Figure from Kidrobot and Hasbro. Add him to your collection today and get ready for a battle of epic proportions! Ages 15 and up.